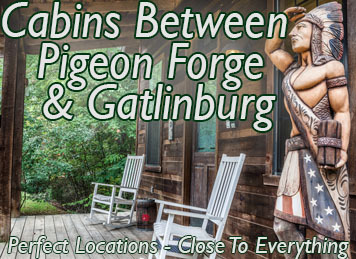 Cabins in Pigeon Forge TN WE CHARGE NO BOOKING FEES LIKE THE LARGE NATIONWIDE SITES. Get Your Private Mountain Cabin for about the price of a Decent Hotel Room. Hot Tubs, Fully Furnished Kitchens and Cabins in AMAZING Central Locations. Finding the PERFECT Pigeon Forge Cabin can be a Stressfull Event. Our Family Owned and Operated Cabin Rentals can Make It EASY and give you the VACATION OF A LIFETIME! Enjoy a stress-free and laid back Vacation here with NO BOOKING FEES. We make it FUN and SIMPLE to plan a vacation you will never forget! Since we are a Family Owned business we don’t EVER have to charge a BOOKING FEE and never will. Booking with us is EASY! Call or make a Reservation Online to find the Perfect Rental. Our Cabins are Conveniently Located and just a Short Drive from Pigeon Forge. 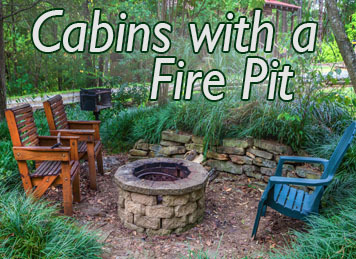 We have Cabin Rentals that fit Small and Large Groups. 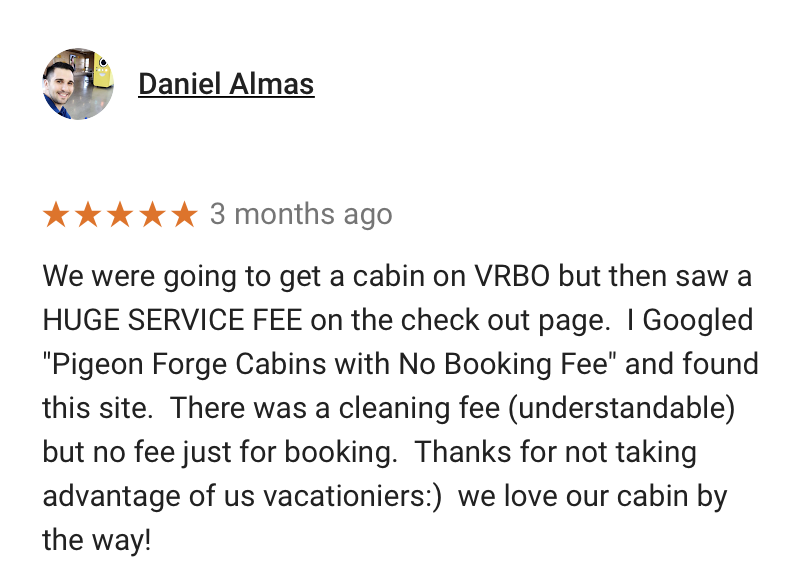 Our Cabin Rates are very AFFORDABLE, usually Cheaper than a Decent Hotel Room, but with more Amenities and Space to Enjoy your Vacation! 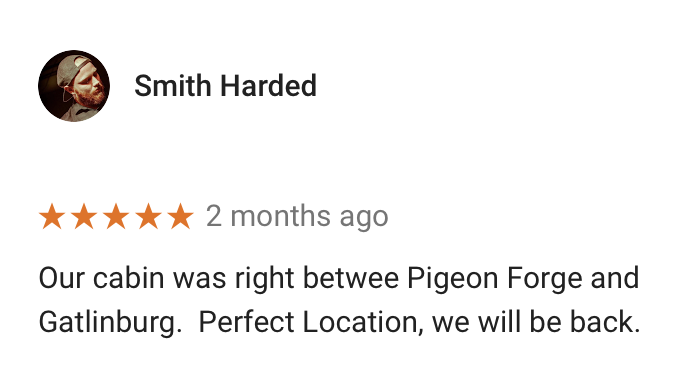 Check out these reviews from some of our satisfied customers that have stayed with us in the past! Why are Pigeon Forge Cabins so Fun?! The amazing thing about Pigeon Forge is that there is so much fun in such a small area. Anything you can think of is available for you on the parkway! There are over 800 miles of trails to hike in the Great Smoky Mountain National Park and over 20 waterfalls to explore. There is something fun for everyone with famous attractions like Dollywood, the Titanic Museum, and the Elvis Presley Museum. Pigeon Forge Tenn is a great town to visit anytime of the year. There are plenty of things to do outdoors when the weather is great and fun indoor activities for the winter visitors, so you will never run out of entertainment! Family Owned Cabins can accommodate any group size and would like to make your vacation the best one yet. Each of our cabins is centrally located, has beautiful mountain views, and special amenities designed to make your stay relaxing and enjoyable. Where are the Pigeon Forge cabins located? 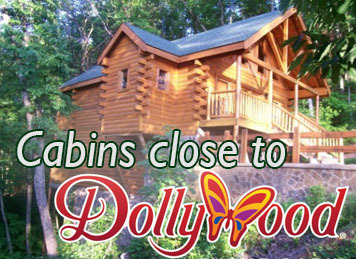 All of our cabins are centrally located just a short drive from Pigeon Forge and Gatlinburg! You will never have to worry about driving too far to reach any destination while staying at Family Owned Cabins. Just a short distance away is the downtown area where you can find many restaurants, unique shopping, and dinner theatres. Take a walk around the historic Old Mill Square situated on the Pigeon River. Enjoy a nightly musical show at the Country Tonite Theatre. The possibilities for entertainment are never ending! Located just a stone’s throw away from most of the family friendly attractions in the town, our cabins are sure to be the perfect location for any vacation. Which cabin is perfect for your getaway? Are you looking to have a nice romantic getaway? If so we have honeymoon chalets equipped with an indoor pool and a heart-shaped hot tub. Are you wanting to take a vacation with your family? We also have bigger cabins with up to 5 bedrooms available for larger groups. No matter what you are looking for, large or small, Family Owned Cabins can accommodate for any size group! Are you done with paying extra for a one room simple hotel with limited amenities? 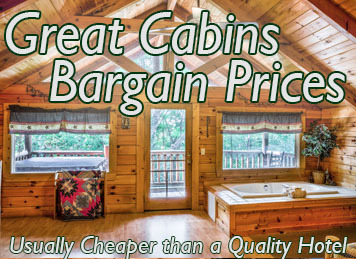 At Family Owned cabins in Pigeon Forge Tennessee you can rent a cabin for cheaper than the price of a hotel room and still be able to have a cozy atmosphere with gorgeous mountain views. A fully furnished kitchen, private hot tub and a laid-back atmosphere are just a couple of the things we provide in each cabin. 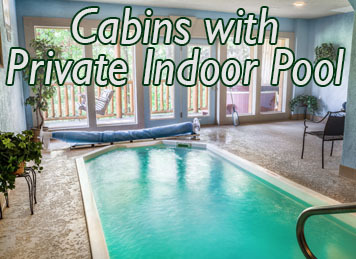 If you are someone that is looking to be pampered during your stay, our Swim N Bear cabin has a private infrared sauna and an indoor pool for your rest and relaxation. 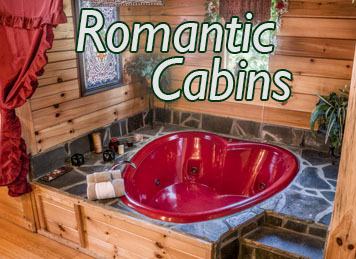 If you value privacy, our Honeysuckle Ridge cabins are located on top of their own little mountain right in between Pigeon Forge and Gatlinburg. If you’d like to ditch the boring hotel and upgrade to the finest cabins in town, check out our online reservations now! and much more. *Check Each Rental Individually for a list of specific amenities. Here at Family Owned Cabins it is important to us that you have the best vacation imaginable. We make this possible by creating a fun and peaceful environment for each and every one of our guests! Let’s face it vacation is a time to retreat from ‘reality’. Family Owned Cabins makes it easy for you to do just that. Stoke the fire while listening to relaxing music, sit down in one of our rocking chairs and pick up a book you’ve been wanting to read. Take a relaxing walk on the many trails available in the area or unwind in your very own private hot tub inside your cabin. 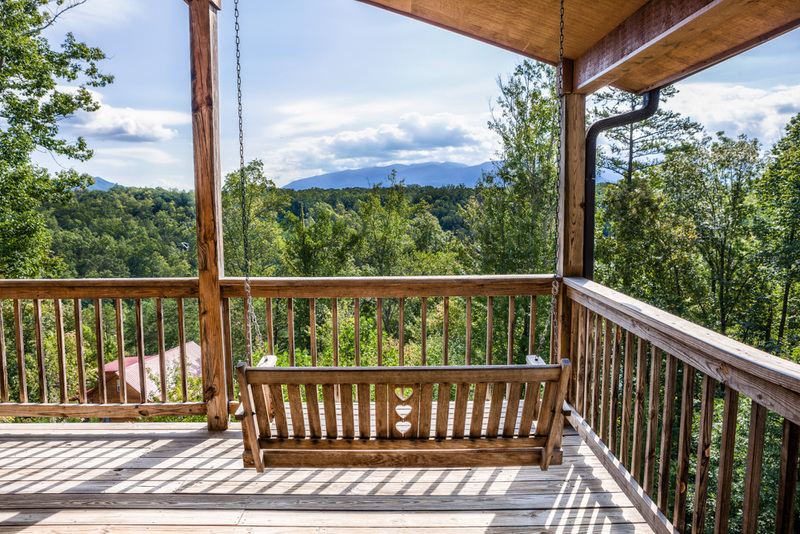 Take in the beautiful views of the Smoky Mountains while staying in any one of our comfy cabins.